Just a glance at this 2005 Jeep Rubicon TJ from afar gives you a clue it’s not your average road warrior, but rather some more athletic, overland version. 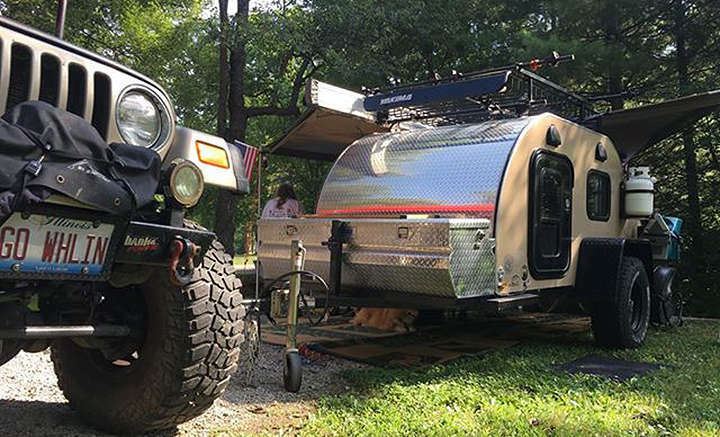 Paired with an off-road TC Teardrop Camper, owners Jeff and Sue Fitch have quite the setup for some serious family OHV camping getaways. Probably the most obvious change, aside from the 35×10.50×15 Cooper STT-Pro tires wrapped around MIckey Thompson Classic Rims, is the Rubicon’s suspension has been upgraded with TeraFlex’s Long Flexarm system. A 4 inch coil lift on this TJ paired with a 2 inch body lift, gives enough room for the 35 inch rubber, through the full range of suspension travel. 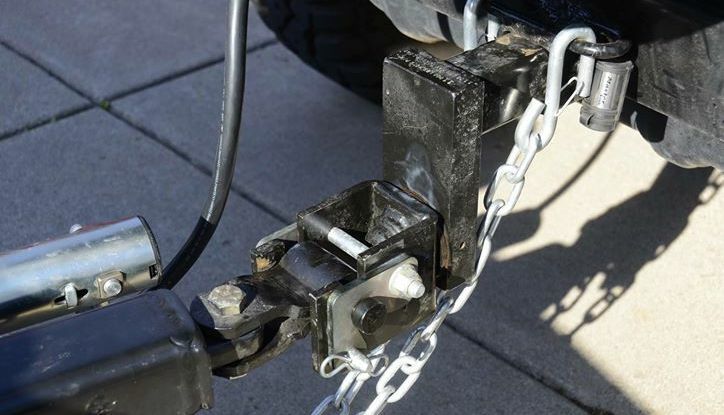 “The combo works great on and off road. I’ve put 120,000 miles on this system and all I’ve replaced are some link ends. Excellent system!” states Jeff. To compensate for the Rubicon suspension upgrades, steering was also beefed up with Synergy heavy-duty steering linkage and a Fox steering stabilizer. Horsepower & torque get a bit of a boost through updates to engine inhalation, with an AIRAID intake & PowerAid throttle body spacer. A Gale Banks header & exhaust system out the other end, and a Superchip tuner give even a more of an HP boost. Capping the ends of this beefy Rubicon TJ are Warn bumpers. A Warn mid-width bumper in the front houses a synthetic rope spooled up around a Smittybuilt X20-10 winch that even has a wireless remote. And the Warn rear bumper pragmatically features a spare tire carrier. Onto the trailer! 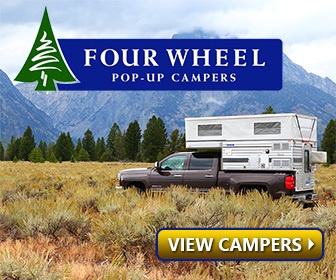 If you aren’t already familiar with TC teardrops, they have a unique take on the classic teardrop design that’s stylish, full of practical features and affordable. The version Jeff and Sue own is a 2016 model; the largest called a 5’x10’ (even the name is practical). 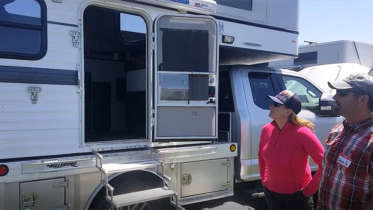 Jeff and Sue’s trailer is outfitted with TC Teardrop’s Off-Road Package which they promote as being “Designed for the serious off-road enthusiast!” Sounds like a great fit for Jeff’s Jeep! Solar panel for LED cabin and galley lights, 13” tv and USB outlets. Canoe rack over Yakima roof basket. Rear drop down leveling stabilizers. For overhead coverage from sun and rain, Jeff added an Oztent Foxwing Awning. Extra sleeping quarters attach to the awning in the form of an Oztent Tagalong Tent. And finally, to ensure maximum comfort, Jeff incorporated a ClimateRight portable HVAC unit. It’s quite a well thought out setup. Nice work Jeff and Sue we appreciate you sharing your TJ/TC camping combo it’s obvious you’re a Savage Camper! Be the first to comment on "Jeep Rubicon TJ with Off-Road TC Teardrop in Tow Means Serious OHV Camping Getaways"